Had it not been for the genre details on the flyer, nothing about Peri M’s name would have given away the kind of music they play. 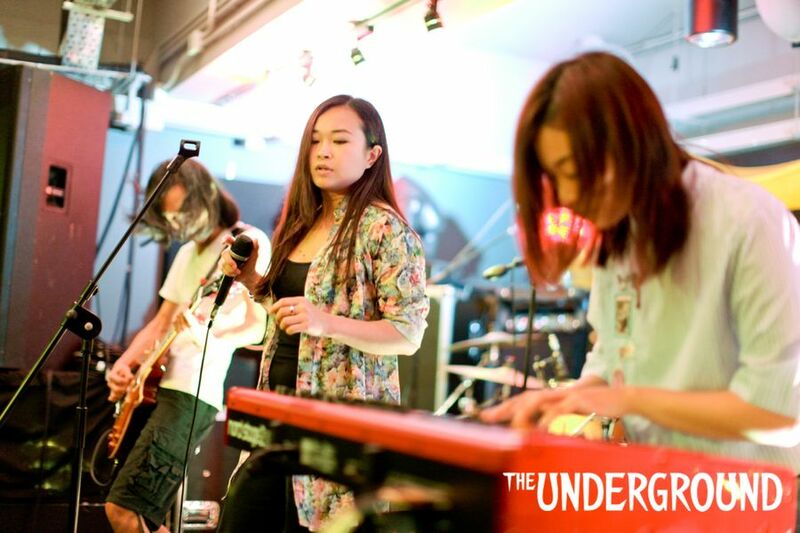 Like the only other hard rock band on the bill, Bamboo Star, the local five-piece vamp up their genre to caricature levels, employing dark themes and gothic overtones. The band delves deep into the annals of heavy metal and exhumes a sound that tips its hat to the likes of Kind Diamond, Mercyful Fate and Black Sabbath, but is also indebted to the contemporary theatrical romance of HIM, Ghost and Evanescence. Lead singer Aeolus was both delicate and fearsome, her crystal clear voice alternating between soft canto-pop songstress and soaring rock frontwoman. Eunice’s keyboard gave the songs an eerie aesthetic; from the spiralling, celestial synths of opener 太平盛世 to the haunting organ intro to 本我. Kai on guitar proved himself to be stunningly skilled, producing enough variation in tone with his Kemper Profiler to make it sound like there were multiple guitarists on stage. Meanwhile, Turn B’s devilish Sabbath bass clongs gave the performance an unshakeably sinister edge. 1.X.2012 turned full-on gothic wedding with ascending soprano vocals and an irresistibly grandiose marriage of grand piano twinkling with robust guitar chords. Like Opeth’s Beneath The Mire, 花無我 began with high, compressed strumming before showing its teeth with heavier distortion, straight-from-the-crypt organ and a bass-heavy metal breakdown. But 城邦故事 was a different kettle of fish, closing the show with distinctively positive ambiance involving cheery vocals and sunny guitar that sounded like the theme tune to a daytime TV drama. An effortless segway into a summer of live shows for this talented rock outfit. I think it’s important for me to admit at the beginning of this review that I’m not exactly an avid fan of heavy music. I appreciate that it takes skill to bring together all the elements necessary to create such a dense and musically rich sound but it’s just not my style. Having said that I completely understand why a lot of people DO like a heavier sound, and the skills of Peri M are a clear reflection of how good it can be. It has to be said that they have one massive advantage over any similar bands and that’s its lead singer. Her range and tone was faultless, in short she has a beautiful voice. While I can see the evanescence like quality of this set up works well, it also made me wish she didn’t have to fight over the noise of the rest of the band. But that’s not important. Her voice made the songs mesmorising and more approachable, and the moments in which they pulled back all the different elements were truly captivating. All in all I feel Peri M is possibly one of the few heavy bands that could tempt me over the darker side in the future. Another great voice. Oh yes, Underground 65 was certainly a treat. Peri M is a five-piece band with the typical line up of two guitars and the rest. They were very humble, but the bio said they formed in 2002, and played J-rock cover for a few years until they started doing their own songs. Clearly, the years of seriously doing cover songs were doing them a lot of good. Singer Aeo has a great voice (every band in tonight’s show had a great voice, damn!) and they as a band were tough enough to do a Iron Maiden cover, with all the good 80’s metal riffs (Chris B must be really mad by now). I was not a learned scholar in J-rock, so I could only comment that their 80’s metal riffs and wholesome bass, which to me, was old school metal, was very good. With the typcial variation of fast and slow rock songs, they eventually went into an emotional number called “Candle Of Life” when they asked the audience to please raise the candles on the tables, or your lighter, or your cell-phone. Man alive! have we de-evoluted so far that we had to depend on LCD lights to rock an evening. Oh well, it didn’t burn your fingers, I suppose.